State-of-the-art has primarily exploited the compiler-level techniques for improving the performance and energy. This chapter aims at enabling reliability-driven compilation enabled by the instruction-level reliability models of Chap. 4 that quantify the reliability-wise importance of different instructions and the impact of their interdependencies on the vulnerability variations. 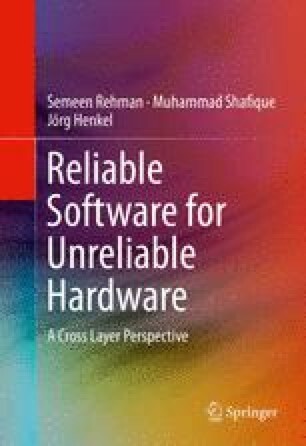 This chapter presents several novel techniques for reliable code generation in order to increase software program’s reliability under user-provided tolerable performance overhead constraints. Improved software reliability can be achieved in two orthogonal and equally important ways: (1) Reducing the error probabilities by reducing the vulnerabilities to soft errors and critical instruction executions; and (2) Error detection and recovery through instruction duplication or triplication, where selective redundancy can be applied to reduce the performance overhead.